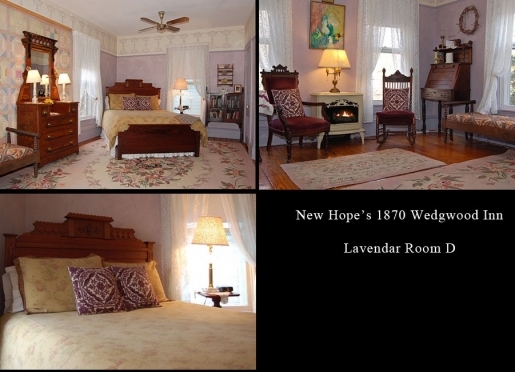 New Hope, Pennsylvania's 1870 Wedgwood Bed & Breakfast Inn, a nationally acclaimed New Hope bed and breakfast inn, is a Wedgwood-blue colored Victorian "Painted Lady" listed on Bucks County Registry of Historic Places. Wedgwood Inn is spelled Wedgwood, not 'Wedgewood' because Wedgwood Inn is named after the Englishman Josiah Wedgwood who invented the famous Wedgwood blue bone china. The Wedgwood family name does not have a second "e" in its spelling. 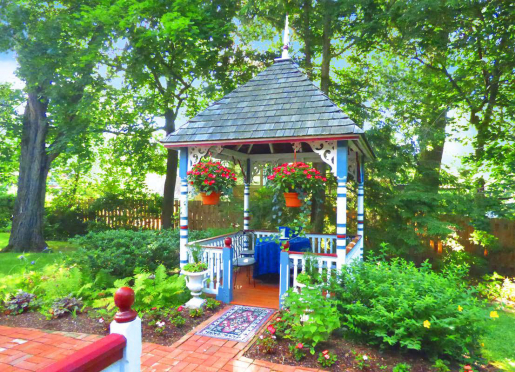 Set on 2 private acres of a park-like setting with flower-lined brick walkways leading to two gazebos and a hammock, yet just steps from New Hope's historic and vibrant village and the walking bridge to Lambertville and nearby Princeton, New Jersey. Rated 3 diamonds (AAA) and 3 1/2 stars (MOBIL Guide). Voted "Inn of the Year" by readers of inn guidebooks published by Lanier International Ltd.
Welcoming refreshments and home baked goodies are served on your arrival and are available to you all day long. 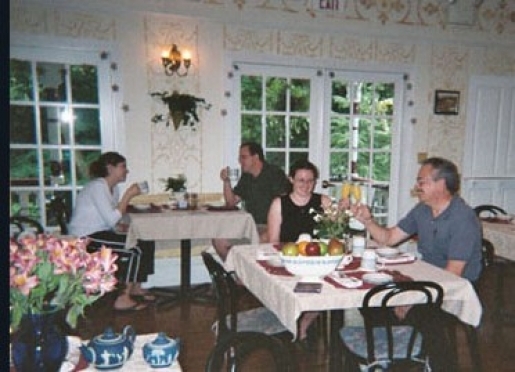 An Afternoon Tea, hosted by your innkeepers, is also served on Saturdays. 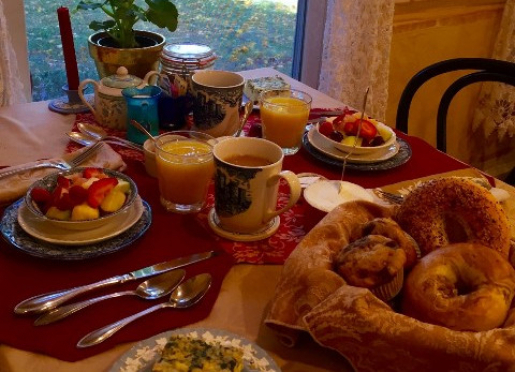 Breakfast is served daily, in bed, on our expansive dining porch, or on one of our Victorian covered porches. Indulge in some of our Special Services such as Gift Certificates, In-room Massage, Pool, Tennis or Health Club privileges. Or, perhaps, treat yourself to flowers, chocolates or a special gift basket. 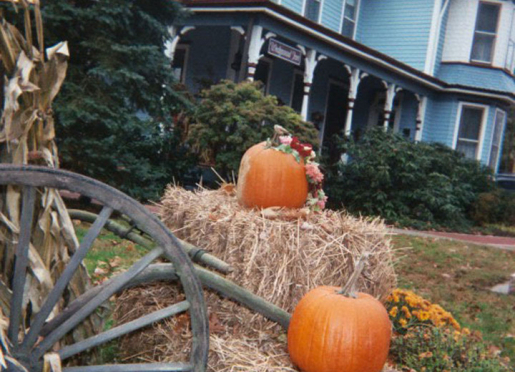 Let us customize your stay in New Hope to experience all that Bucks County has to offer. New Hope was chosen America's #1 Arts Destination in the Small Cities/Towns category for 2005/6 by American Style magazine. Our Inn has been fortunate to have been featured on the cover of several magazines including National Geographic Traveler and The Innsider. TV coverage includes CNN's "Travel Show", "Romantic Inns of America", "Business with Lou Dobbs" and in a series on New Hope Ghost Stories. The Wedgwood has been independently rated and approved by AAA and Mobil Travel Guide -- New Hope's only establishment with these honors. Open year round, we are located in New Hope , midway between New York City and Philadelphia, and across the bridge from Lambertville and Princeton, New Jersey, and less than 3 hours from the Baltimore/DC Metro area. 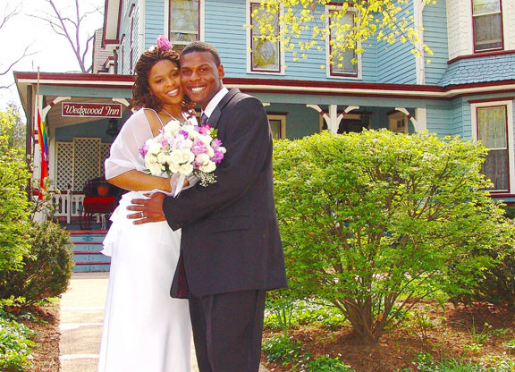 Minutes off I-95, the Inn is easily accessible by car, train or bus line from NYC. So why not discover our enchanting village for the first time, or all over again. Stay with us and experience why we were just "Voted Best of Philly" 2005-2006 by the editors of Philadelphia Magazine and was also featured in the NY Times (March 2006). 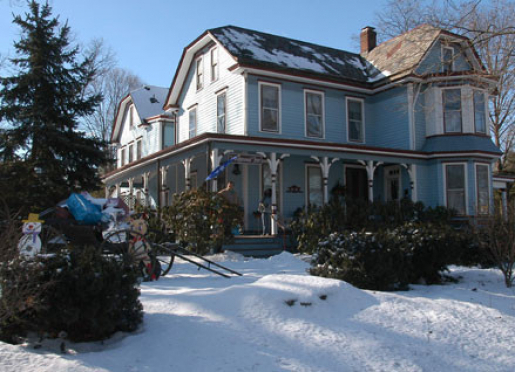 New Hope's 1870 Wedgwood Bed and Breakfast Inn is a gracious Wedgwood-blue colored Victorian "Painted Lady." Wedgwood blue colored walls and trim and authentic Wedgwood china is found throughout the Wedgwood Inn. 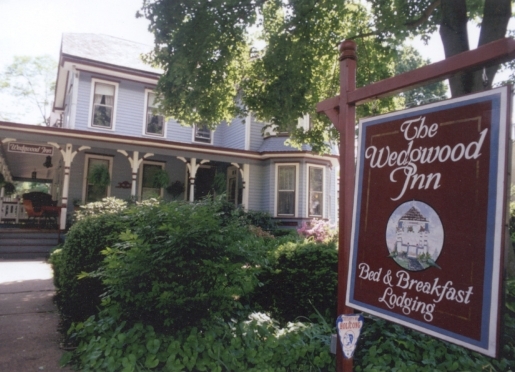 Wedgwood Inn is named after Englishman / inventor Josiah Wedgwood, and he spelled his name Wedgwood, not Wedgewood. 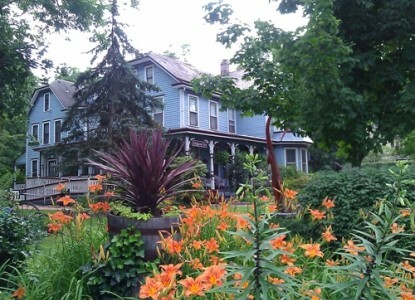 The Inn looks great in all four seasons and is the subject of choice for many photographers and painters. The original portion of the Inn once served as a camp site for General George Washington and 1200 Continental Army soldiers in December 1776, just prior to the famous Christmas Eve Crossing of the Delaware River (which took place a few miles from the Inn). Today the Wedgwood c combines Victorian splendor with such modern amenities as 2 person Jacuzzi tubs, Fireplaces, and complimentary wireless internet connections. We serve both corporate and leisure travelers and also host business meetings and special events. The inn is set on 2 private acres of a park-like setting with flower-lined brick walkways leading to two gazebos and a hammock, yet just steps from New Hope's historic and vibrant village and the walking bridge to Lambertville and nearby Princeton, New Jersey. Days begin with a generous home baked breakfast and ends with a tot of Carl's secret-recipe Almond Liquor and chocolates at your bedside. Coffee is available at 7 am and breakfast is served daily from 8:30 - 9:45 am – on Wedgwood china, of course – in the Wedgwood's expansive Breakfast Room (we have tables for 2, 4 and groups of 8) and on our covered Victorian Porch. 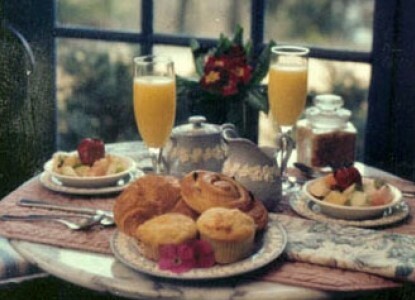 If you prefer, you may request Breakfast delivered to your guest room or your private porch (with advance notice). An early Breakfast Tray can also be arranged in advance. 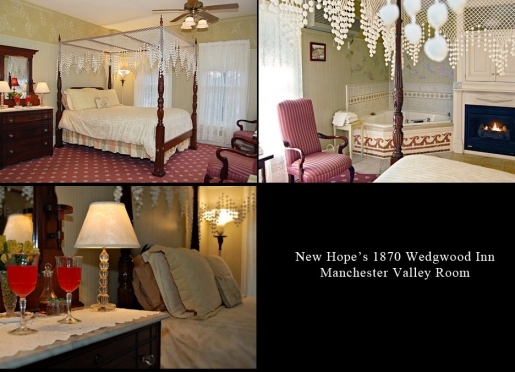 Guest Rooms and Suites at New Hope's 1870 Wedgwood Bed and Breakfast Inn are individually painted and stenciled by a New Hope artist and graced with fresh-cut flowers all year 'round. Hand-picked antiques, original art, scented English soaps, plush towels and extra pillows are in all guest rooms. All rooms have private baths, queen or king size bed, color cable TV, telephone with voicemail and air conditioning. Some also have a double Jacuzzi, private porches and / or fireplaces and brass ceiling fans. The Wedgwood Collection of Inns offer 18 rooms and suites with a range of value-priced amenities. All rates are for double occupancy, and include refreshments and home baked treats on arrival, an evening turndown service (which includes chocolates and a tot of Carl's secret recipe Almond Liqueur), daily maid service, and a generous home baked breakfast each morning, which can be served to you (on Wedgwood china, of course!) in our Dining Room, on our Back Porch, or if you prefer, in the privacy of your own room. All accommodations have telephone with voicemail, individually controlled air conditioning, color cable TV, free wireless internet access, free onsite parking and more. In addition, Pool & Tennis Club, as well as Health Club privileges are also available for a small fee. All accommodations - and the entire Inn - is "Smoke Free." No smoking, candles or incense are permitted inside our historic in. 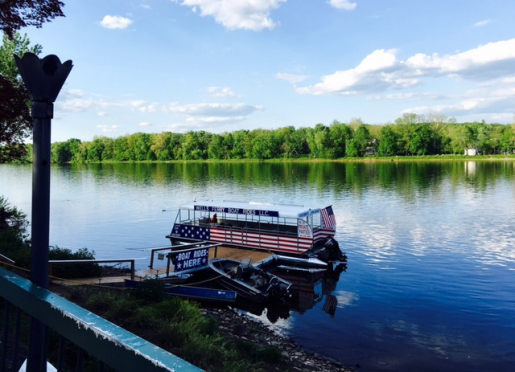 Open year round; walk to everything the vibrant twin river towns of New Hope and Lambertville have to offer! 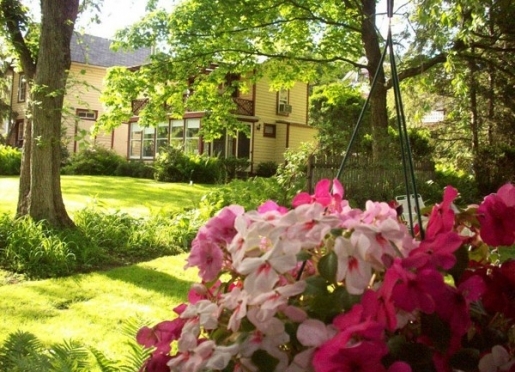 The Wedgwood Inn also offers free local calling from your room phones, and intercom capability between rooms too. 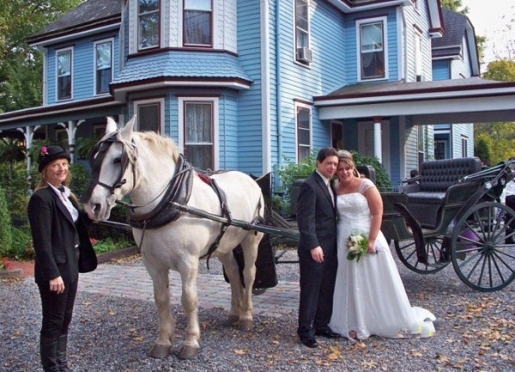 In addition, we have free WiFi access from your sleeping room, all our public rooms as well as from our Victorian porches and Gazebo. 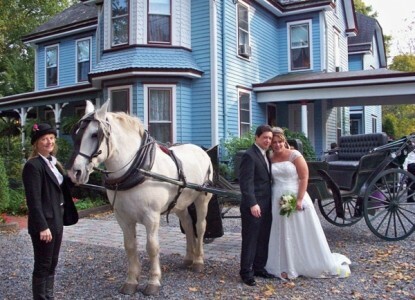 For Additional Lodging Options Visit Our Aaron Burr House (across the street from the Wedgwood). Ideal for your next business meeting. 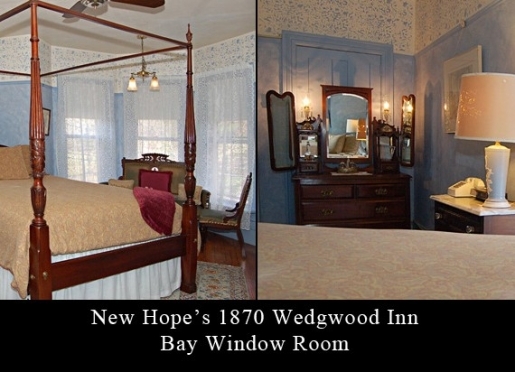 New Hope's Wedgwood Collection of Historic Inns has successfully hosted off-site conferences since 1982. Day and overnight training sessions, study groups, executive seminars and corporate retreats have all been hosted here, effectively combining business and pleasure. Please note, we host only one meeting at a time. Facilities include 5 conference rooms accommodating up to 26 people, set on 2 park-like acres which are ideal for breaks and lunch. We provide complimentary on-site parking. We have 18 overnight guest rooms and suites for your conference attendees. This new 2000 square foot wing accommodates meetings of 26 people on the main level. 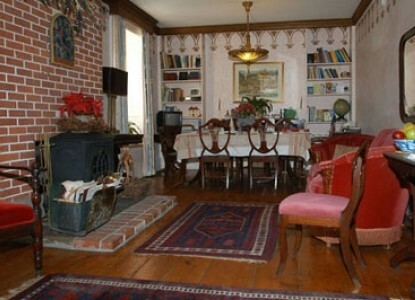 This room has high ceilings, 3 tall windows, hardwood floors and 4 French doors which lead to a covered Victorian porch. It is handicap accessible and also has an adjoining handicap bathroom. 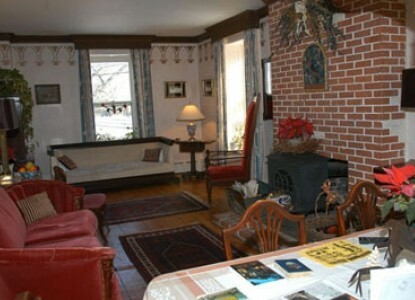 Adjacent to the Main Meeting Room is the Fireplace Room. This space has tall ceilings, a fireplace and the French door leads out to a covered Victorian porch. This room is often used as break-out space in conjunction with the Main Meeting Room. It is handicap accessible and also has an adjoining handicap bathroom. There is also a TV/VCR. 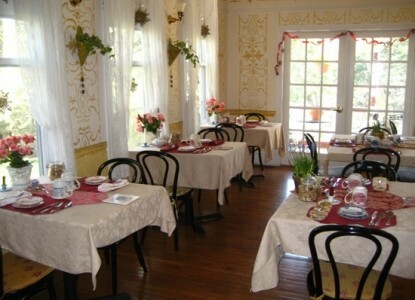 The 300 square foot Wedgwood Parlor is well suited for meetings of 8 people or for break-out space for a larger group. A fireplace, telephone, 4 tall windows, high ceiling and a combination of tables, chairs and couches. 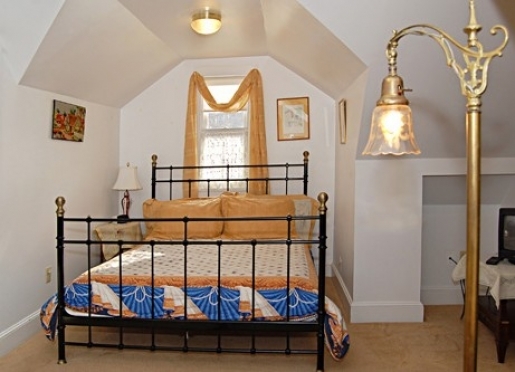 It is handicap accessible and also has an adjoining handicap bathroom. All your meeting requirements are expertly managed by the staff of the Wedgwood Inn. All our "learning vacation programs" take place in New Hope, Bucks County, Pennsylvania. A small river town across from Lambertville (NJ), New Hope has a 350 year history as a big centre for antiques, handcrafts, historic attractions, fine dining and live music and entertainment. How to Start and Run Your Own Bed and Breakfast Inn, co-authored by Carl Glassman. First published in 1992, the second edition is now available. You can purchase an autographed copy by calling the Wedgwood Inn directly (215-862-2570) or emailing us. This is a "must" read for any prospective innkeeper. 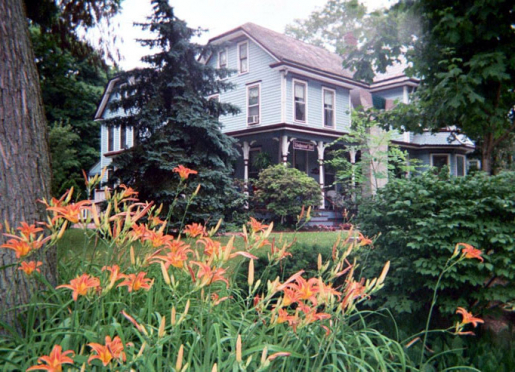 "Ask New Yorkers where they go for a romantic getaway, and more often than not, you'll hear 'New Hope, Pennsylvania'". Offers an express bus trip from NYC: 610-868-6001 www.transbridgebus.com Call us in advance to arrange for complementary pick-up from the bus stop.